“Best of the best!” Still dreaming? Bonus! My new word!!! ……….. wow! If only I can be permitted by the English language to add a word to the dictionary then it will be “KEDAP” and my meaning of it will be the team of teams or best of the best! The letters in the word have their meaning and with all due respect I have came to realize that this word deserve to be added to the English dictionary. If am ask to do a thesis for this I will surely write more than a manual in defense of KEDAP! Despite not been a university graduate or a professor, take me on it and I will hammer home the points straight. Love4Gambia has without doubt played an integral role in the building of my word (KEDAP!)….. (Much more about KEDAP in my next blog). Being my second blog post, I feel a bit unsure of the reaction I might get compared to the first blog I posted before. As a team member for the Love4Gambia run, I have had series of days that I have thought it was all a dream. The whole team has evolve from Canadians and Gambians to a cemented brotherly and sisterly tie that has been built to not only foster the relationship we have as a team but to save the lives of young Gambians and west African through the peer health education program of the Nova Scotia Gambia Association (Ashley and Kebba have showed us how much of brother and sister they are by always been on opposite ends of any discussion..:)). The idea was conceived and planned for by Coach Erin with the help of those people who share this great idea of helping to save the lives of young people in the Gambia thumbs up for your achievement (don’t worry coach Erin I mean our achievement!!!…:)) . Taking a trip back to that faithful day when the team assembled at west field prepared to take off to Banjul, I said to myself whiles driving to the office “we are going to accomplish our mission today” and the answer came YES! (Do your best and forget the rest). Despite having a blistered toe, I couldn’t at the time in anyway ruin my coach’s wish of getting the whole team to the ocean. (Don’t get worried coach am all fine and kicking around now and as for the nurse…hmmmmmm am sorry!!! At least am in charge now since am writing the blog..) As a matter of fact what kept me going was the leadership strength built in Erin as a person who inspires and drives the entire team to this historic run, I was also motivated to make more kilo meters than Spiderman (tell u what, he was doing everything possible to sing his song for me but hmmm I was already inspired to go for it by my able coach… Spider don’t worry when we go to Lagos you can try again…lol). As a team we were able to reach the Ocean of course not without Cathy going on to get her 5KM..lol (tell you what she has done more running of the NSGA so she needed the rest! I salute you Dr. what could we do without your support). The sense of accomplishment I felt as we hold hands and raise them in the air before we get into the ocean was something I have never felt before, I cried. The water felt so good and I felt so happy and proud of everyone most especially Erin who ran every kilometer from Koina to Banjul. May I once again in writing say thank you to Erin and to all those who have donated to this worthy cause and those who have followed every step of our run. As a team for the world, we played our part and you played your part and I personally value every penny been put in to this run. Without doubt this will go a long way in saving the lives of many vulnerable young people in the Gambia. LOVE YOU ALL. NAMASTE!!!!!! When we were dropping off Erin and Ashley at the airport we dove for almost two KM without anyone mentioning a word, everyone was thinking and my next blog will interview all the team members present in the truck what they were thinking!!!. AKON is still with me..:)Confession time who hide my Akon on the trip!!! 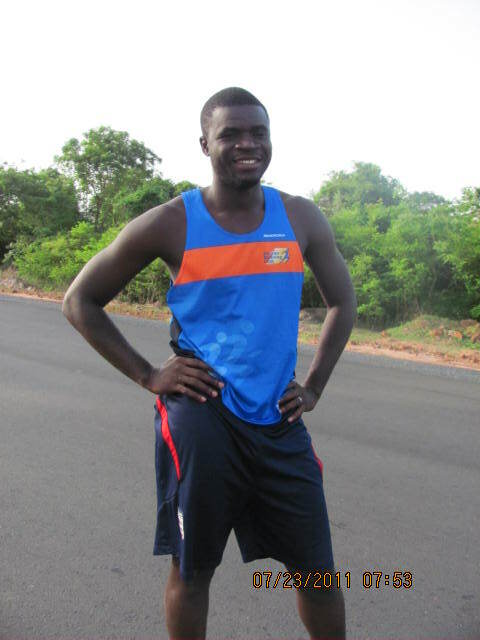 This entry was posted in Running in Africa and tagged achievement, Akon, Atlantic Ocean, Banjul, coach, running, team. Bookmark the permalink. 5 Responses to “Best of the best!” Still dreaming? Bonus! My new word!!! Love you Pa Modu and team =) Can’t wait to hear more about KEDAP… I have an idea about where this one is going! And I truly believe you had just misplaced AKON for a few days, or maybe you hid it yourself for entertainment??? I’m sticking to it, and I think even Kebba and I will agree on this! Great blog!!! I was worried I wouldn’t have my “fix” for reading but I am glad to see that you wrote again. =) Words can’t describe an experience like that and I know Erin will hold it in her heart forever. I was telling Erin thaI facebooked Akon on your behalf and will let you know if I ever get an answer back!!! Great blog Pa Modu. I hope the donations keep flowing even though the team has completed it run. Erin and Ashley are doing great PR here so maybe ……..more to come……. Keep up the great work that you and Kebba do in The Gambia. Love hearing things from your perspective Pa Modou! You have had such an impact on Erin – and I think your humor and positive attitude is one of the reasons for her successful run. I’m wondering if in all your team talks Erin ever challenged you and Kebba to run across her country now that she has run across yours? Ha ha ha…I guess it wouldn’t be fair, over 5000 km is a bit of a long way! Hope you keep up the running and keep blogging too!